I last made this journey whilst on holiday in Torquay back in the early 70's and even then I only went as far as Torquay, so part of this journey was new track to me. 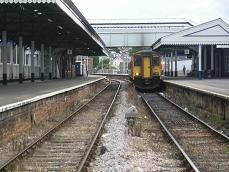 Newton Abbot is still a grand station with its original canopies in place, though it now only has three platforms, two of them having been filled in. The front of the station has a fine Georgian style facade, though sadly you wouldn't know that it's Newton Abbot Station as most of the letters are missing. My train should leave from platform 1, but as it's almost fifteen minutes late, it leaves from platform 2. It's also very crowded, overcrowded in fact with standing room only all the way down the aisles. I end up standing as far as Torquay, where the majority of passengers get out. We pull away and curve to the left in a wide cutting, with just three tracks, before moving to the left hand track. The busy A380 is running parallel to us on our left, whilst on the right it's already green fields. We then move off the Great Western main line and turn south westwards onto a very bumpy unwelded line. There are still plenty of houses on the left hillside and then we go onto welded track. We start to descend, passing semis on the left with long gardens down to the track side and green fields on the right. The A380 pulls upwards away from us and is high above us. We are now doing about 40 mph as houses appear on the right side now as we go into a cutting and slow down as we come into Torre station. It has been recently repainted and has the black and white GWR station signs on both its platforms, as well as a green and red covered staircase. We then pull away on an embankment high above the houses, which are mainly painted a cream colour. We start descending and see palm trees everywhere as we come into Torquay station. It has two platforms with the remains of a track bed in the middle of its two tracks. The station buildings are of grey slate and in good order, though the over bridge looks like it's in need of a coat of paint. The train empties here and is now only about a third full. We pass the Grand Hotel on the left and go into a cutting, curving first to the right and then to the left before emerging to our first view of the sea on the left. We then move inland again and start to climb upwards, entering a cutting. We see the sea once more and then houses appear on both sides as we emerge to see Paignton Pier and beach on the left. We then go onto another embankment, passing a park on the right. We go over a level crossing and come into Paignton station. It has two platforms and is attached to the Dartmouth Steam railway. I can see some old GWR carriages on its platform, but don't know if a stream engine is on the front of them. There are about twenty people waiting to get on and about twice that number get off. I realize that all through the journey the guard has not checked our tickets.